The image above shows unusual (but existing!) 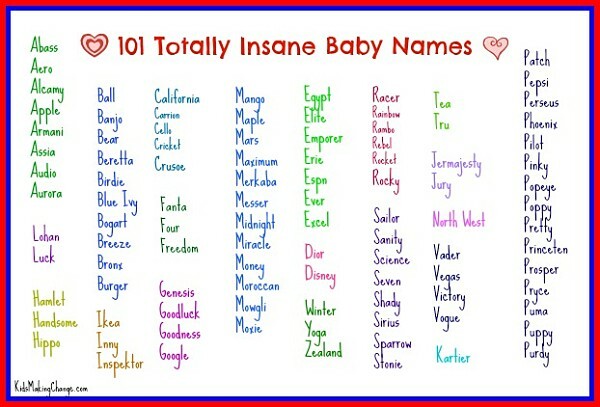 American Baby Boy Names and Baby Girl Names. From the 1880s until the 1960s, the most popular American Baby Boy Names were John and Robert, while the most popular baby girl name was Mary. These names started falling out of fashion in the sixties, as more and more Americans grew minds of their own. By the decade of 2000-2009, Mary had dropped to 65th place on the list of most popular baby names, with Emily finishing first. Of the boy names, John was in 18th place, with Jacob coming in first out of all American baby boy names. Scroll down for a list of the most popular American Baby Boy Names and Girl Names for each U.S. state in 2014. Also see a list of the Top 20 Trending American Baby Names for 2018. This info was obtained from ssa.gov, and from the experts at Nameberry.